Ciliary body melanoma (see the image below) is a rare tumor. It is encountered approximately one tenth as often as is choroidal melanoma. See Choroidal Melanoma for complete information on this topic. Transpupillary photograph of ciliary body melanoma. See The Case of the Middle-Aged Woman with Sudden Unilateral Vision Loss, a Critical Images slideshow, to help identify and treat malignant intraocular tumors. Ciliary body melanoma is a subtype of uveal melanoma, the most common primary malignant tumor of the eye. Uveal melanomas are the most common primary intraocular malignancies and the second most common type of primary malignant melanoma in the body. They can be classified as anterior uveal melanomas when the tumor arises in the iris and as posterior uveal melanomas when it arises in either the choroid or the ciliary body. Intraocular melanomas can involve 2 uveal structures simultaneously, such as in ciliochoroidal melanoma. See the images below. Fundus photograph of a large ciliary body melanoma. The ocular tissue where these tumors arise, the uvea, is a densely pigmented layer that lies for the most part between the sclera and the retina. The uvea is subdivided into the iris, ciliary body, and choroid. The ciliary body is located between the iris and the ora serrata. It has a specialized function in the uveal tract; it produces aqueous humor, facilitates trabecular outflow, intervenes in alteration of the shape of the crystalline lens during accommodation, and secretes hyaluronic acid into the vitreous. Melanoma in the ciliary body poses a serious threat to life. It usually remains hidden behind the iris diaphragm, growing undetected for longer periods of time than melanoma in the iris or choroid. Patients who die from ciliary body melanoma die because of distant metastasis rather than local spread. Its metastatic potential depends on the phenotype of the tumor cells, and it frequently disseminates before diagnosis. If the melanoma does not show extraocular extension, it only can disseminate hematogenously, because the eye has no lymphatic vessels. It has a tendency to spread preferentially to the liver. Other frequent sites of metastasis are lung, bone, skin, and central nervous system (CNS). Less frequently, ciliary body melanoma can grow transsclerally, through emissary channels, and can spread locally into the orbit and conjunctiva. Local growth of ciliary body melanoma produces signs and symptoms as it pathologically involves adjacent structures. Separation and disruption of the overlying ciliary epithelium decreases its production of aqueous humor with consequent ocular hypotension. Growth of the melanoma into the lens may produce its subluxation, lenticular astigmatism, or cataract. 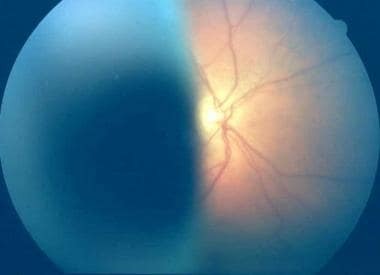 Erosion of the tumor into blood vessels in adjacent tissues, or areas of necrosis within the tumor, can lead to hyphema or vitreous hemorrhage. Ciliary body melanomas can push the iris diaphragm anteriorly, or they can infiltrate the trabecular meshwork, producing acute angle closure. Some ciliary body melanomas with diffuse growth patterns can extend around the circumference of the ciliary body for 360°. These are known as ring melanomas and have a greater tendency to metastasize and grow extrasclerally. They can cause such secondary effects as cataract; lens subluxation; hyphema; orbital involvement via extrascleral extension; and, rarely, corneal involvement. Tumor-induced glaucoma may be produced by obstruction of outflow pathways by pigment cells (pigment dispersion syndrome), melanin-laden macrophages (melanomalytic glaucoma), or tumor cells. Additional mechanisms of glaucoma include rubeosis iridis, angle closure, and direct invasion of angle structures. Primary ciliary body melanoma arises from melanocytes in the uveal tract. Although uveal melanomas may grow de novo, most develop from a preexisting melanocytic nevus. Three distinct cell types are recognized in uveal melanomas: spindle A, spindle B, and epithelioid. Epithelioid cells are associated with more aggressive behavior and carry a poorer prognosis for the patient's survival. Ciliary body melanomas are mostly found in whites, particularly in those with light-colored irides. Some evidence suggests that increased sunlight exposure contributes to the development of ciliary body melanoma, but this is not well established. The incidence of primary intraocular melanoma is 4.3-6 cases per 1 million population per year. Ciliary body melanoma represents about one tenth of all intraocular melanomas. A higher incidence of uveal melanoma has been reported in the southern latitudes of the United States than in the northern latitudes. This difference may be the effect of more sunlight exposure in the lower latitudes or a tendency of older Americans to retire to the South. The incidence of intraocular melanoma is much greater in countries populated by people of northern European descent than elsewhere in the world. In Denmark and other Scandinavian countries, the annual incidence is about 7.5 cases per 1 million population per year. Most cases (97.8%) of uveal melanoma occur in whites, particularly whites of northern European descent. The incidence of ocular melanoma among blacks is extremely rare. Hispanics and Asians are thought to have an intermediate risk compared with whites and blacks. Uveal melanoma is slightly more common in men for most age groups; however, from age 20-39 years, a small predilection for women is noted. Uveal melanoma shows a peak incidence at 55 years. In Asians, a tendency exists for the condition to occur at a younger age. A study in Europe reported that 1.4% of uveal melanomas occur in people younger than 20 years. Uveal melanoma is generally exceptional in children. Visual prognosis is guarded for melanomas in the ciliary body. An overall mortality rate of 30-50% occurs from ciliary body melanoma within 10 years of diagnosis and treatment. Most often, mortality is related to the development of distant metastasis. Peak incidence of metastasis occurs during the first year after diagnosis of the primary intraocular melanoma; however, metastases can appear for the first time years later. For uncertain reasons, ciliary body and anterior choroidal melanomas have a worse prognosis for patient survival than do posterior choroidal melanomas. 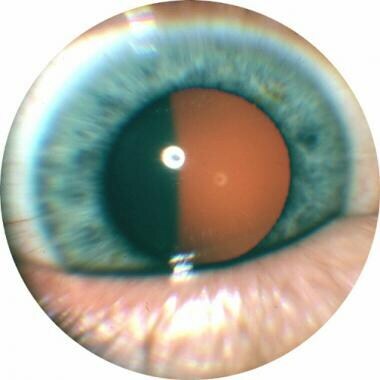 Possible reasons include delayed diagnosis, as the ciliary body melanoma is hidden behind the iris diaphragm, and an easier regional path to hematogenous spread for the ciliary melanoma. The latter factor is perhaps facilitated by the continuous contractions of the ciliary-iris muscles. An additional factor found to correlate with worse survival prognosis in ciliary body melanomas is their increased vascularization. Some investigators have advocated preenucleation radiation of the eye as a way to improve survival. However, the COMS demonstrated neither a positive effect nor a negative effect on the 10-year mortality rates among patients whose eyes containing large choroidal melanomas were randomized to treatment with enucleation alone or enucleation preceded by external radiation. Ciliary body melanomas cause partial or total visual loss in the affected eye from direct pathologic involvement of ocular structures or as a result of the treatment used. No effective treatment exists yet for metastatic uveal melanoma. Blurred vision may occur consequent to growth of the melanoma into the crystalline lens, leading to lenticular astigmatism or cataract; they may also block the visual axis directly or via an intraocular hemorrhage. Floaters can be reported when areas of necrosis within the tumor or adjacent structures produce vitreous hemorrhage or hyphema. Painless visual field loss may be present as the melanoma grows centrally and posteriorly. Photophobia may result from anterior uveitis. Severe ocular pain occasionally can be associated with ciliary body melanoma, secondary to high intraocular pressure because of acute angle-closure glaucoma. A history of weight loss, marked fatigue, cough, or change in bowel or bladder habits should prompt consideration of primary nonocular malignancy with ciliary body metastasis. A preliminary report from the COMS showed that clinical diagnosis has an accuracy rate of 99.7%. The premanagement evaluation of ciliary body melanoma should include a thorough physical examination, with particular attention to the hepatic abdominal region and the skin and subcutaneous tissues, which are frequent sites of metastatic spread. Patients can present with painless visual loss or inflammation and pain from a complicated tumor, but many patients have no symptoms, and melanomas are discovered upon routine ocular examination. An early sign of an occult ciliary body melanoma is a sentinel vessel, which is 1 or more dilated episcleral blood vessels feeding the metabolically active tumor and is visible through the conjunctiva overlying it. This finding should prompt the physician to dilate and carefully examine the anterior-posterior segment. Another early physical sign of an occult ciliary body melanoma is unexplained, unilateral low intraocular pressure, as compared with the healthy fellow eye. A difference of 5 mm Hg or more may be the only initially detectable external sign of a tumor affecting the ciliary body. Posterior uveal melanomas can grow into the sclera (mainly through emissary channels) and extrasclerally. If located anteriorly enough, it may appear as a small subconjunctival area of abnormal hyperpigmentation. Melanomas in the ciliary body may grow anteriorly into the anterior chamber pushing the iris root centrally, becoming visible on biomicroscopy. Most ciliary body melanomas can be observed as a darkly pigmented mass that is posterior to the pupil. Nevertheless, pigmentation ranges from inapparent to dark brown. These tumors may have a diffuse, nodular, or mixed pattern. Most commonly, they are solitary, dome-shaped, sessile tumors, although multicentric melanomas have been described. They usually are solid, but they can be cystic. The location of the melanoma in the ciliary body makes diagnosis difficult, because pupillary dilation and indirect ophthalmoscopy or a 3-mirror contact lens are needed to visualize the lesion. Transillumination is helpful in localizing the tumor. Its accuracy depends on melanin content, dark pigmentation, and whether or not a hemorrhage is present in the tumor. Ciliary body melanoma is rare and tends to be last among the differential diagnoses. It must be distinguished from benign and malignant tumors, cysts, and other abnormal masses in the ciliary body. Because the most common site of metastasis is the liver, obtain liver enzyme levels in any patient with ciliary body melanoma. The most sensitive hepatic function tests are serum levels of gamma-glutamyl transpeptidase, lactic dehydrogenase, and glutamic-oxaloacetic transaminase. If any of these serum levels are abnormal, ultrasonographic and computed tomography (CT) scan studies of the liver are indicated. Unfortunately, both imaging modalities have low sensitivity for micrometastasis (smaller than 1-2 cm in diameter). In tumors more than 3 mm thick, standardized ultrasonography has a diagnostic accuracy of over 95%, and it is helpful in distinguishing melanomas from ciliary body cysts. B-scan ultrasonography is especially useful for imaging the eye in patients with media opacity and as a means of estimating tumor size. Routinely evaluate patients with unilateral cataracts using ultrasonography to rule out the possibility of a retrolental mass. Ultrasonography also can be used to evaluate extraocular extension. The ciliary body is a difficult ocular region to evaluate with B-scan. Immersion technique and comparison with the contralateral healthy eye often are needed to detect a small mass in the ciliary body. Ultrasonographic biomicroscopy (UBM) has high resolution for ciliary body abnormalities, including melanomas. It can help to differentiate tumors of the ciliary body from those of choroidal origin and help to define the anterior border. It also is helpful in assessing angle closure and localized narrowing. Perform chest radiography in patients with ciliary body melanomas for the possibility of lung metastasis. CT scanning of the globe and orbit is more expensive than ultrasonography and is currently not as sensitive. It requires intravenous contrast media. CT scanning is useful to see extraocular extension and to help to differentiate between detachment and a solid tumor. Magnetic resonance imaging (MRI) of the globe and orbit is more expensive than CT scanning and is not as sensitive as ultrasonography. Intravenous gadolinium highlights the melanoma in the ciliary body. Pigmented melanomas are seen as high-density images in T1 and low-density images in T2. Fluorescein angiography and indocyanine green angiography are more useful in the diagnosis of choroidal melanomas. Genetic analysis and karyotyping of biopsy specimens have gained increasing attention. Fine-needle biopsy (FNAB) is indicated when there is diagnostic uncertainty. FNAB is increasingly being performed for prognostic purposes. It does not appear to increase metastases. Specific genetic errors are progressively better understood, such as inactivation of BAP1 (BRCA-associated protein 1), which is associated with metastatic spread, often through monosomy 3. Gene expression profiling outperforms monosomy 3 at predicting metastatic spread. Analysis of multiple gene expression has lead to the subdivision of uveal melanomas into 2 types. Around half of ocular melanomas are class 1, which carry a low risk of metastasis. The other half are class 2, which have a different gene expression pattern, frequently showing chromosome 3 monosomy, and carry a high risk of metastasis. However, because no effective treatment is available for metastatic disease, the clinical impact of performing routine biopsies on choroidal melanoma is unclear at this point. Some experts have argued against this practice. Histologic evaluation of the tumor after enucleation can confirm the diagnosis and evaluate prognosis. Three distinct cell types are recognized in uveal melanomas, spindle A, spindle B, and epithelioid. Spindle A cells have elongated nuclei and, uncommonly, have mitotic figures. Spindle B cells have an elongated profile, but they are slightly larger than spindle A cells and have prominent nucleoli. They are found more commonly than are spindle A cells. Epithelioid melanoma cells are highly anaplastic and poorly cohesive, and they have considerable morphologic variation. They tend to resemble epithelial cells and to contain frequent mitotic figures. Evaluation of vascular supply of the tumor, age at presentation, presence of extrascleral extension, tumor size, tumor cell types, mitotic rate, nucleolar area, and quantification of nucleolar organizer regions have been used for prognostic purposes. Epithelioid cell melanomas and mixed cell melanomas carry the poorest survival prognosis. The choice of management of ciliary body melanoma remains controversial in many respects. Although enucleation has been the treatment of choice in the past, the results of the COMS showed that vision-sparing approaches may offer similar degrees of ocular and metastasis tumor control. At diagnosis, posterior uveal melanomas have already spread through micrometastasis in many patients. Although undetected metastatic spread at the time of diagnosis and treatment of ciliary body melanoma is a major concern in every patient, adjuvant systemic treatment is not currently advocated. This consensus comes from treatment trials with intraocular melanomas and extrapolation of the experience with cutaneous melanoma, where adjuvant treatment has shown no benefit. In cases in which distant metastases are found during the initial systemic workup, management of the intraocular melanomas becomes palliative. Systemic chemotherapy is the primary treatment. Many modalities and combinations of chemotherapeutic and immunotherapeutic agents are noted; however, for the most part, results continue to be disappointing. Increased survival times have been reported with high-dose interleukin-2 (IL-2) regimens, immunotherapy (eg, ipilimumab), inhibition of the mitogen-activated protein (MAP) kinase pathway (eg, with vemurafenib in patients whose tumors have a V600 mutation in the BRAF gene), glycoprotein peptide vaccine, anti–PD-1 and PD-L1 immune checkpoint inhibitors, trametinib (an orally available small-molecule selective inhibitor of MEK1 and MEK2), and the multikinase inhibitor. Although melanoma is a relatively radiation-resistant tumor, palliative radiation therapy may alleviate symptoms. This is an area of intense medical research with ever-increasing degrees of biologic sophistication being applied to new clinical trials. Multiple modes of treatment are available for ciliary body and other uveal melanomas. In determining an approach, multiple factors need to be considered, such as visual acuity of the affected eye and of the contralateral eye, intraocular pressure, ocular structures involved, size of the tumor, age and general health of the patient, and presence of metastases. Observation may be acceptable for posterior uveal tumors when diagnosis is not well established. In particular, tumors of less than 2 mm in elevation can be observed until growth is documented. Sequential measurements of the tumor dimensions with ultrasonography are necessary. Enucleation is the classic approach to posterior ciliary body melanomas. It often has been the preferred treatment of advanced and complicated tumors, which compromise visual function, and when other therapies have failed. Because of the potential release of malignant cells into the bloodstream and orbital soft tissues during the surgical procedure, keep manipulation of the globe to a minimum. Some physicians advocate for preenucleation radiation therapy to hypothetically reduce local and hematogenous dissemination. The theoretical advantage of enucleation over vision-sparing treatments is a decreased risk of metastatic spread. It remains unproven, however, whether enucleation truly improves the patient's prognosis for life over vision-sparing techniques. External beam irradiation with either protons or helium ions is a frequently used alternative method to treat medium-sized tumors (< 10 mm in height and 15 mm in diameter). Radiopaque tantalum rings are usually sutured to the sclera to serve as reference markers for alignment of the radiation beam. By causing irradiation-induced vessel damage, the tumor necroses and regresses. Treatment may be complicated with radiation cataract, dry eye syndrome, radiation retinopathy, and rubeosis iridis. Patients treated with this method may have a survival rate comparable to those treated with enucleation. About 15% of eyes ultimately require enucleation, often because of neovascular glaucoma or local recurrence. Plaque brachytherapy is a widely accepted alternative to enucleation for medium-size posterior uveal melanomas (< 10 mm in height and 15 mm in diameter). It has similar indications and success rates as external beam irradiation. Plaques containing radioactive isotopes of iodine-125 are attached temporarily to the sclera and limbus underlying the melanoma. (Radioactive agents that were used in the past include iridium, cobalt, palladium, and ruthenium, among others.) A computerized calculation is used to determine the dose and duration of plaque application for a radiation delivery of approximately 40,000 cGy to the base and 8000 cGy to the apex of the tumor. 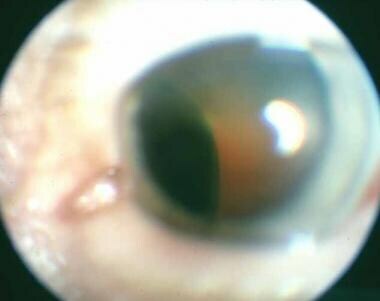 Local recurrence, usually requiring enucleation, occurs at a rate of about 12%. This procedure can cause complications, including radiation retinopathy, but at a reduced rate compared with that of external beam irradiation. Block excision, or sclerouvectomy, is an alternative treatment method for ciliary body melanomas covering less than 4 clock hours of the circumference. The procedure’s goal is to salvage the eye, with most of these patients retaining some useful vision. It consists of a full-thickness excision, with in-block removal of the ciliary body, cornea, iris, and sclera, with a 2-mm to 3-mm margin of healthy tissue around the tumor, followed by the grafting of banked sclera and cornea to close the defect. Retinal detachment, vitreous hemorrhage, and cataract are common complications. These risks are improved by a modified approach, lamellar sclerouvectomy, which uses a scleral flap and minimizes altering of the retina and vitreous. In a small proportion of cases (about 15%), local reappearance of the melanoma requires subsequent enucleation. Laser photocoagulation and transpupillary thermotherapy are used in selected small choroidal melanomas, but it is not usually useful for ciliary body melanomas. Orbital exenteration is a radical treatment reserved for cases with extensive orbital extension. The usefulness of such disfiguring surgery is not established. Patients with such advanced melanomas are likely to have extensive distant metastases and poor prognosis for survival, with or without orbital exenteration surgery. Consultation with an oncologist, specifically a radiation oncologist, may be indicated. Irrespective of the treatment modality chosen, patients with ciliary body melanomas need to be monitored carefully for many years. This is particularly true for patients with small ciliary body tumors when the diagnosis is not clearly established. Close observation and measurement of the tumor dimensions with any of the diagnostic tools mentioned earlier is critical. Repeat examinations are usually performed about every 3 months initially, and if no changes are seen, follow-up care is completed every 6 months. If growth of the lesion is detected, consider further treatment. Ciliary body melanomas may show size regression starting several months after being treated with external beam irradiation or plaque brachytherapy. The goal of successful treatment is not necessarily reduction in size but long-term arrest of the tumor's growth. Because of the possibility of intraocular or extraocular tumor recurrence, repeat examinations and imaging tests are performed after all treatment modalities. Follow-up care in patients with treated ciliary body melanomas should include thorough physical examinations, liver function tests, and imaging of the lungs, repeated about every 6-12 months. Early detection of distant metastases may affect management and survival. Patients with choroidal nevi, a family history of uveal melanoma, congenital ocular melanocytosis, dysplastic nevus syndrome, and other predisposing conditions of uveal melanoma may benefit from careful, annual ophthalmologic examinations. Limiting excessive ocular sunlight exposure through sunglasses or other means may, theoretically, have a preventive effect in patients with predisposition to intraocular melanoma. COMS Report. The Collaborative Ocular Melanoma Study (COMS) randomized trial of pre-enucleation radiation of large choroidal melanoma II: initial mortality findings. COMS report no. 10. Am J Ophthalmol. 1998 Jun. 125(6):779-96. [Medline]. COMS Report. Mortality in patients with small choroidal melanoma. COMS report no. 4. The Collaborative Ocular Melanoma Study Group. Arch Ophthalmol. 1997 Jul. 115(7):886-93. [Medline]. COMS Report. The Collaborative Ocular Melanoma Study (COMS) randomized trial of pre-enucleation radiation of large choroidal melanoma III: local complications and observations following enucleation COMS report no. 11. Am J Ophthalmol. 1998 Sep. 126(3):362-72. [Medline]. Odashiro M, Odashiro A, Leite L, Melo M, Odashiro P, Miiji L, et al. Melanocytoma of ciliary body and choroids simulating melanoma. Pathol Res Pract. 2010 Feb 15. 206(2):130-3. [Medline]. Shields CL, Ganguly A, Materin MA, et al. Chromosome 3 analysis of uveal melanoma using fine-needle aspiration biopsy at the time of plaque radiotherapy in 140 consecutive cases: the Deborah Iverson, MD, Lectureship. Arch Ophthalmol. 2007 Aug. 125(8):1017-24. [Medline]. Bellmann C, Lumbroso-Le Rouic L, Levy C, Plancher C, Dendale R, Sastre-Garau X, et al. Uveal melanoma: management and outcome of patients with extraocular spread. Br J Ophthalmol. 2010 May. 94(5):569-74. [Medline]. [Guideline] Nag S, Quivey JM, Earle JD, Followill D, Fontanesi J, Finger PT. The American Brachytherapy Society recommendations for brachytherapy of uveal melanomas. Int J Radiat Oncol Biol Phys. 2003 Jun 1. 56(2):544-55. [Medline].